While the focus of this blog is economical selections, one must remember that value comes with getting the most out of your purchases. This is the Lamy Safari fountain pen fitted with a Lamy 1.1mm calligraphy nib, available on Jetpens. 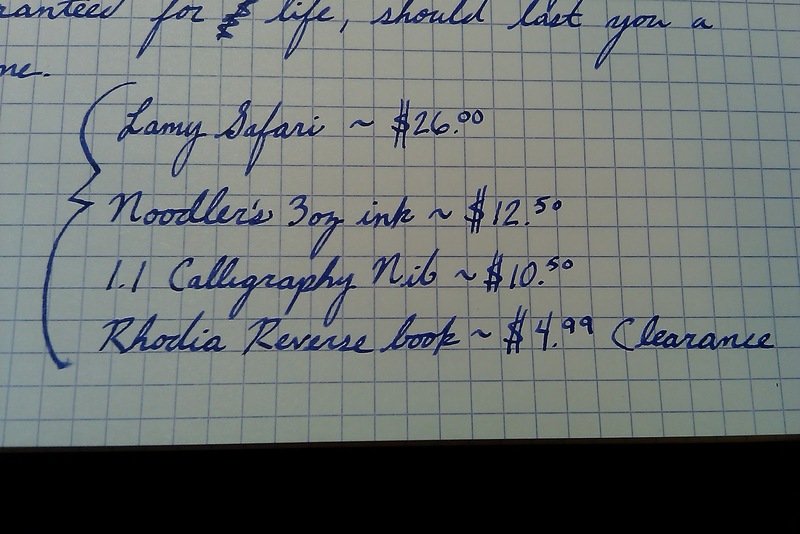 The main thing to keep in mind when spending $26 for a pen and $10 for a replacement nib is the value over time. Lamy guarantees their pens for the life of the pen, and they have been around for spell, so they know how to make a quality product. The pen itself is made of ABS plastic, and there is little concern for dropping it or carrying it with you in your pocket. This pen will last you, and there are dozens of reviews out there if you want to learn more about this pen. I chose the color charcoal, which is like a matte black, and the nib that came with it was an extra fine. If you want to dip your toes in the world of fountain pens, I'd say this is a good place to start. If you want to do it even cheaper, you could try a Platinum Preppy, which will be a later review. 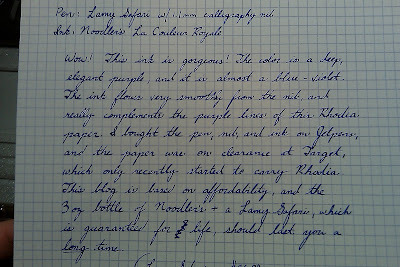 The ink shown above is Noodler's La Couleur Royale - a rich, vibrant, deep purple - which has some bluish tones to it. The ink flows extremely well, and there is no feathering to speak of. 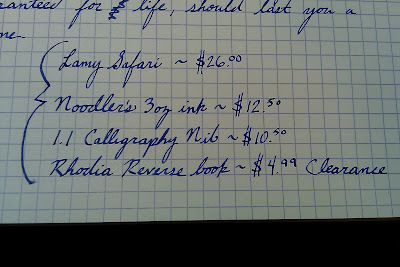 Some credit must be given to the paper - my Rhodia Reverse Book, with 80 gsm graph paper. Some people do not like the grips on the Lamy Safari because of the triangular shape, which is meant to help position your fingers for a more ergonomic writing form, but I do not mind it. 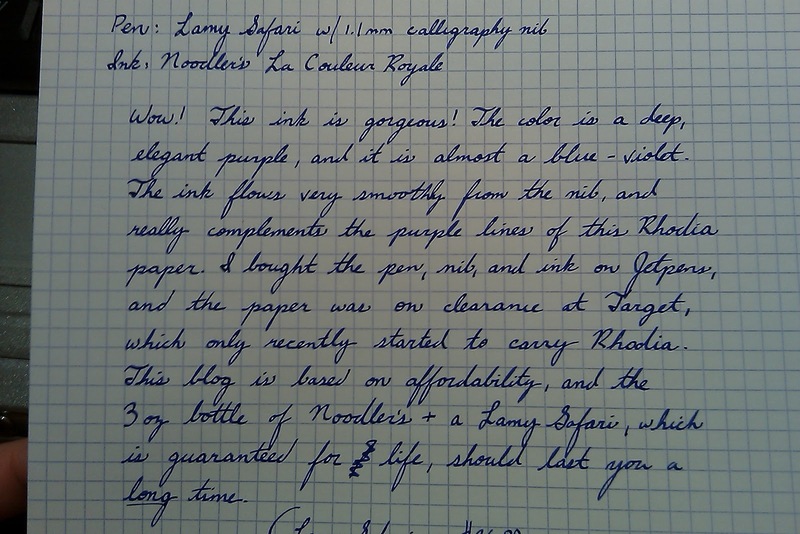 If you like trying new inks, or if you are a purple fan, then this Noodler's ink is a great buy. You will need to get a converter or learn to fill your empty cartridges if you want to try this ink in a Lamy Safari, but another option for you would be to get a pen that has a built-in ink system, such as a piston filler. Some pens, such as the Platinum Preppy, will allow you to convert them to an eyedropper, and there are many tutorial out there to do this, such as this article on Jetpens. But if you have any questions, please let me know, and I will be glad to help. -The grip is comfortable and is nice and grippy, which it should be given the name. -The needle point tip feels sturdy and has no flex. -The ink is super black and I have yet to experience issues with smearing due to the drying time, which is not quite as bad as the Pilot G2 .7mm. The ink is also very smooth, and I have not experienced skipping at all. -This pen is retractable, which may be good or bad depending on your preference. -The value? You get a 4-pack of really great gel pens for about $6 U.S., which is a lot more than I can say for some of the other brands with this level of performance. 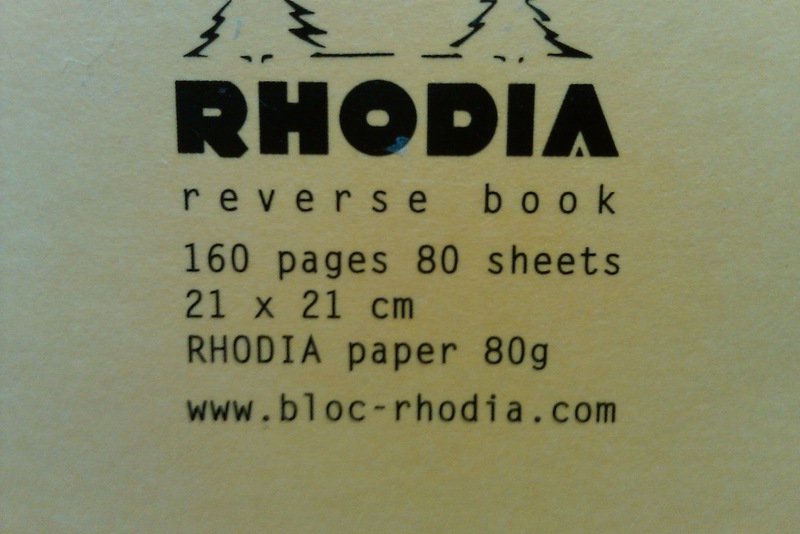 Of course there is the paper which, in this case, is the Rhodia Reverse Book. The paper is incredible, and it is known for being able to handle wet fountain pens and sign pens with ease. The paper is 80 GSM and the Reverse Book includes 80 sheets. The paper is buttery smooth, thick, and is in graph, which is excellent for most of my purposes. One interesting aspect of this paper is the purple lines, which helps many inks show quite well with the contrast of purple and whatever other color that you're using. The one thing that suffers in this review is my camera, which is 5 mega-pixels, but the lighting situation needs improvement; I will work on this going forward. The bottom line is that either of this products would be a great choice, and if you haven't heard of either, then you're in for a treat. Dowdyism @ The Pen Addict also has a review of this TUL pen, which is what led me to purchase these pens in the first place. Biffy Beans also has an excellent blog called Spiritual Evolution of the Bean, which has a ton of great reviews, especially if you like to see fountain pen inks used to create great art. This is clearly my first post. I have never had a blog before, so I need to get acclimated to all of the nifty tools, and then I will be more consistent in my blog postings. This blog will feature my perspective on a variety of office supplies, focusing on affordable pens. Obviously there are many blogs out there that cover this material, but there are never enough reviews to read, right? If you are like me, you have quite a few office supply blogs that you follow to satisfy your need to read more about everything related to office supplies - and those who are addicted to them. I look forward to your feedback, so feel free to comment. Thank you for taking the time to stop by!